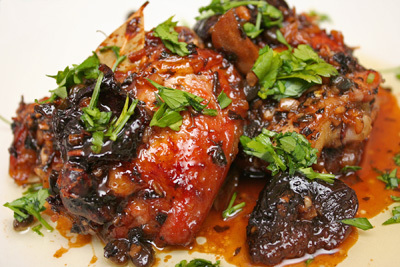 I was pulled into the recipe for “Chicken Marbella,” from The Silver Palate Cookbook, by Julee Rosso, Sheila Lukins, and Michael McLaughlin, intrigued by the combination of vinegar, prunes, olives, capers, brown sugar, white wine. What might I produce with this mixture? I halved the recipe, using 2 1/2 lbs. of bone-in, skin-on chicken thighs only, which I marinated overnight. This magnificent dish produced the pungent flavors that it promised. We could taste the wine, the sweet, the vinegar. I added 1 tsp. salt and 1/2 tsp. black pepper to my marinade. Ten prunes equaled half a cup. My dry white wine was a 2008 Argentinian Torrontes. It’s such a pleasure to dump a pile of marinated chicken parts from the bowl in the refrigerator into the baking pan. I baked my chicken for 1 hour 30 minutes. Try this dish with a group of chicken-loving dinner guests and you will knock them out. And to add to the beauty of this meal, I also made the “Butternut Squash Soup II,” from Allrecipes.com. This was a smooth, delicious soup; my young child ate two bowlfuls. The recipe asked for 4 cups (32 oz.) of chicken stock, but I used 6 1/2 cups vegetable-bouillon broth. I added 4 tsp. salt and 1 tsp. black pepper. Instead of transferring the soup to a blender, I once again relied upon my handy immersion blender: the ideal tool for these blended soups. 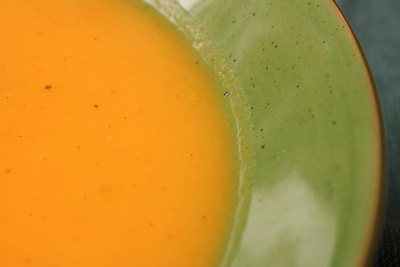 This soup is a triumph that you can proudly serve to your appreciative guests. Next time, I want to cook the “Seafood Stew,” from the October 2009 issue of Everyday Food, along with the “Scalloped Corn New Orleans-Style,” from the December 2009 issue of Cuisine at Home (recipe below). Come back to my site on Thursday, May 27 to see this meal. Preheat oven to 350 degrees F. Coat a 1 1/2-quart baking dish with nonstick spray. Melt butter in large sauté pan over medium heat. Add onion and bell pepper; cook until soft, about 5 minutes. Stir in corn; cook 5 minutes more. Deglaze the pan with sherry; cook until liquid evaporates. Transfer mixture to a large bowl. Whisk together egg, milk, sugar, Tabasco, and thyme; stir into corn mixture. Add cracker crumbs, scallions, salt, and pepper. Transfer mixture to the prepared dish. Bake scalloped corn until it’s brown around the edges, 35-40 minutes.